My name is Bunnie and I’m the first child. We were just an average family but with six children we were not well off financially but VERY well off considering that we had two parents who had always been married to each other and we knew that they loved us. I was married in l940 and Bobby went to war in 1943. After that the only times we saw him were when he got to come home on leave. Bobby sent me a paratrooper bracelet, which I still have and sent pillow tops from all over the world. When my first daughter was young, he would throw her up in the air and catch her and called her a little "Nincompoop". When she learned to talk she called him "Uncle Nincompoop". Mom & I had gone to a neighborhood theater to see "Kismet" when one of our family came to tell us that Bobby had been killed. In the last letter Mom got from Bobby before he died he told her that he felt uneasy about this mission. He said if he didn't make it back he would see her in heaven. 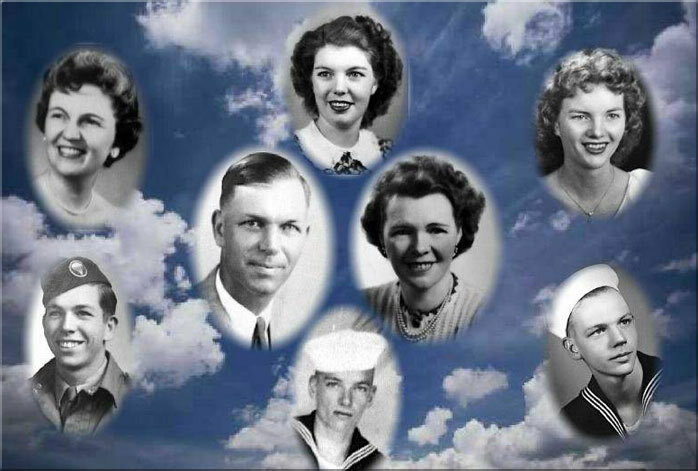 Center: Bob and Lorene, Bobby's parents; Top row, Sisters Bunnie, Gloria, Ruby; Bottom row, Bobby and brothers Bill, Don. My name is Gloria and I’m the second daughter, and third child. Bobby is two years older than I am, so we were very close. He played the part of the big brother very well, and I knew I could count on him. My best friend and his best friend were neighbors, and the four of us did many things together like movies and going to Overton Park playground and swimming pool. Bobby was a boy scout, as were many of his friends. They all went in service about the same time, and I only know of two that came back. I said I could always count on him, and I remember one day the boys were climbing on the garage and jumping off. Bobby said I could do it, so of course I did. The yard was made of concrete and it is a wonder I didn't break my leg, but he said I did good and that pleased me very much. I am sure my other brothers have written about his military time, but I do remember when he was to his first parachute jump, the man who went first, had a faulty chute that didn't open. They still had to make the jump, which was scary enough, but this was really scary. The other five of us are still living in the same general area except for Don. We are all very close, and see each other as often as possible. My name is Ruby. I’m the third daughter, and fourth child. Being four years younger than Bobby, I suppose he just thought of me as his "bratty" little sister. But that all changed when I became a teenager. He began to include me in some of the things he did. I remember one time he took me skating with him.We had to ride the bus to the skating rink and I suppose the driver thought I was his date because he told him he was "robbing the cradle".He quickly explained that I was his sister. But I was so proud to be with my big brother. We even double-dated a few times. When he left we wrote letters to each other. His weren't very long because he tried to write to each of us and our parents, too. He asked me to write to some of his buddies which I did.They all loved to receive mail. He told them I was 17. (I was 15). The last letter he wrote to me was a V-mail. He was somewhere in France.It was dated Feb.28,1945. There was a P.S. MY BIG BROTHER BOBBY. HE'LL ALWAYS BE A HERO TO ME. 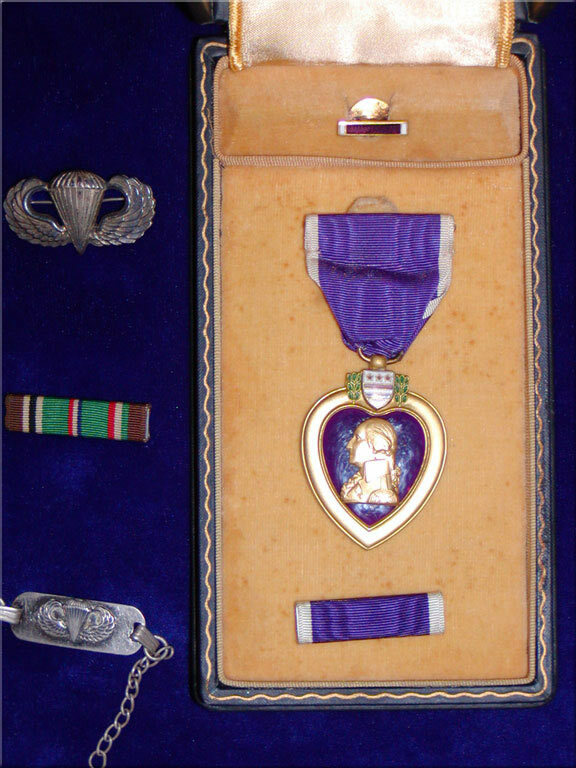 Bobby's Purple Heart, European Service Ribbon, Paratrooper Wings, and a bracelet he gave to his sister, Bunnie. My name is William (Bill). I’m the second son, and fifth child. 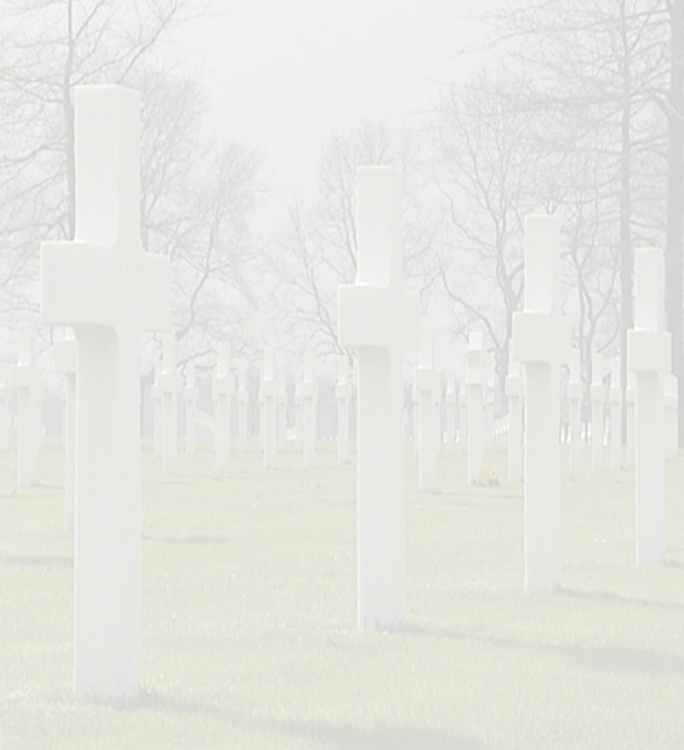 I was only twelve years old when my brother Bobby went to war. When we were children, he treated me as most boys treated their little brothers. His friends were older than I, and when they did things together, naturally they didn’t want me tagging along. They were not mean to me, but they made it clear that they would rather I left them alone and found someone my own age to play with. We children were raised during the great depression, and were very poor, as far as money was concerned, but very rich in the fact that we were always aware that we were loved by our parents and all of our brothers and sisters. When I was nine years old, I helped my dad on his milk delivery route. I earned ten cents a day. I had no bicycle, but Bobby did. He was working in a drug store, and relied on his bicycle to get him to work. One day when he got ready to leave for work, the front axle on his bicycle broke. Being desperate to get to work, and having no money to ride the street car, he offered to sell me his bicycle for ten cents. I bought it, and after saving my money for some time, I bought a new axle for the bike, and fixed it. Bobby would borrow the bike from time to time to go to work, or just to ride with his friends. One day he borrowed the bike and was riding it off of a drop off which was about four feet high. He did this many times. I noticed that the front fork was bent and the front wheel was wobbly. He convinced me that this was a normal condition and that it was what was known in those days as “knee action”. This was a feature on some cars at that time and was a desirable enhancement to the suspension. Needless to say, I was gullible, and he was very persuasive. I remember that when Bobby was approximately 14 years of age, he decided to run away from home. He rode that same bicycle from our home in Memphis, Tennessee to Atoka Tennessee, a distance of approximately 30 miles. Mom and Dad were very worried, but he thought better of his adventure, (probably when he began to get hungry), and went to someone’s home and used their telephone to call our parents. Dad went and retrieved both Bobby and the bicycle. I also remember when Bobby got pneumonia. That was before the days of penicillin, and pneumonia was a devastating disease, which was often fatal. We were all worried that Bobby would die. During this disease, Bobby ate almost nothing except mashed potatoes. He recuperated in time and was physically fit again. I remember that the dairy that our dad worked at gave the employees a family picnic each year. I don’t remember the year, but I remember that the picnic was at Maywood swimming pool and recreation center. Bobby was having fun swimming and diving from the high diving board. I was swimming in the pool, and wasn’t looking at Bobby. The high diving board was situated in such a manner that when you climbed the ladder, the diving platform was over the concrete apron to the pool, with the diving board extending out over the water. I heard a thud and looked around and saw that Bobby had fallen approximately 15 feet to the concrete apron. He was unconscious and of course, not moving. My heart jumped into my throat, and I ran to get our parents, who were at another area close by, but where they couldn’t see the pool. They rushed to Bobby, along with several other adults. Mom bathed his face with water from the pool, and he soon revived with no apparent ill effects. Bobby didn’t remember anything about the fall or the circumstances leading up to it. The adults in the crowd came to a consensus that he had fainted on the platform and that because he was already unconscious and relaxed, he suffered no injuries. In a short time, he was diving again. I don’t remember much about Bobby’s military activity, because he didn’t get to come home but once or twice before being sent overseas with his outfit (17th Airborne Division). 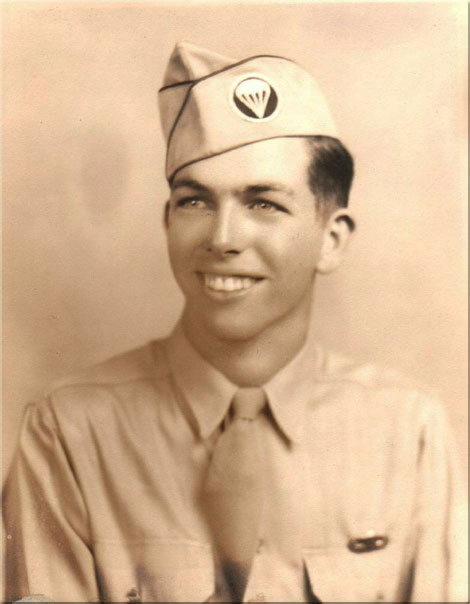 I do remember, however that he took his parachute training at Ft. Oglethorpe, Georgia and was deployed to a staging area in England from Newport News, Virginia, fought in France, Holland, Belgium, and was killed at Wesel Germany on March 24th 1945. I often wonder how his life would have unfolded, had he lived. As of this date he has missed 62 years of life. He was only twenty years and three weeks old when he was killed. That’s all I can remember of my brother. I still miss him. My name is Don. I’m the third son, and sixth child. Mrs Bunnie Durham, sister of Pfc. Robert S. Durham, Jr.
Mrs. Gloria Durham, sister of Pfc. 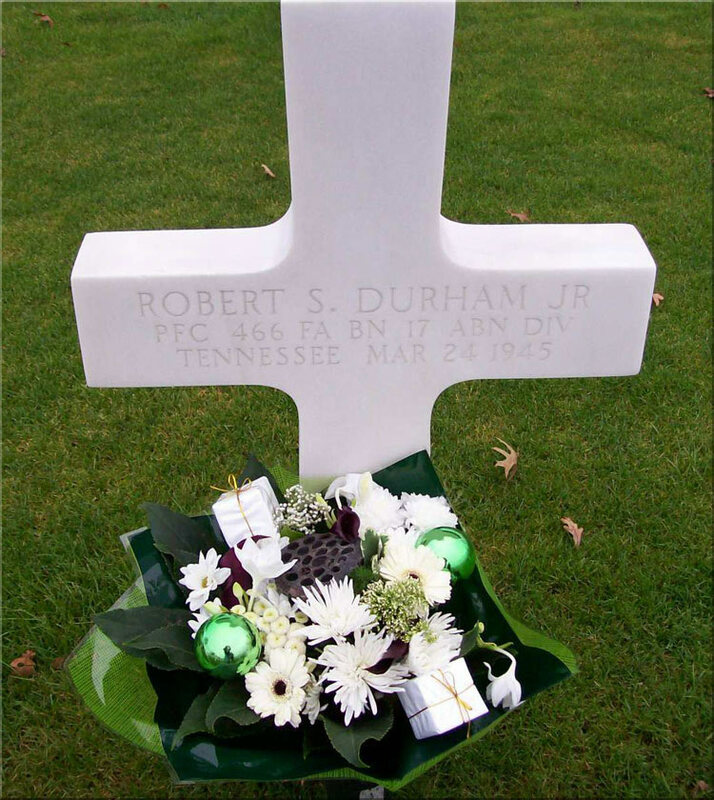 Robert S. Durham, Jr.
Mrs. Ruby Durham, sister of Pfc. Robert S. Durham, Jr.
Mr. William Durham, brother of Pfc. 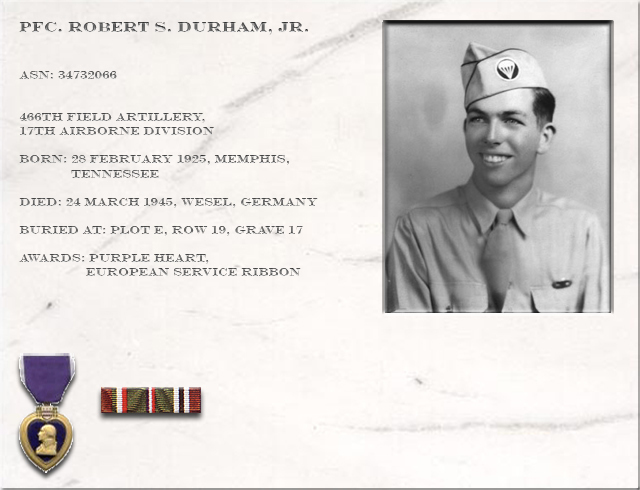 Robert S. Durham, Jr.
Mr. Don Durham, brother of Pfc. Robert S. Durham, Jr.